Stacy Lewis brings more value to the LPGA Tour that just her golf. Along with becoming the first American in 18 years to win LPGA player of the year, and then rising to No. 1 in the world for four weeks, Lewis had a direct hand in bringing two tournaments to the LPGA Tour. One of them is this week, the Bahamas LPGA Classic, which grew out of her partnership with Ohio-based title sponsor Pure Silk. She also aced what amounted to a pop quiz by the chief executive of Marathon Oil, which now sponsors a tournament in July. Lewis, however, is not good enough to dictate weather. A storm the locals haven’t seen in some 20 years pounded Paradise Island through the night, dumping about a foot of rain in an eight-hour span that flooded the Ocean Club. 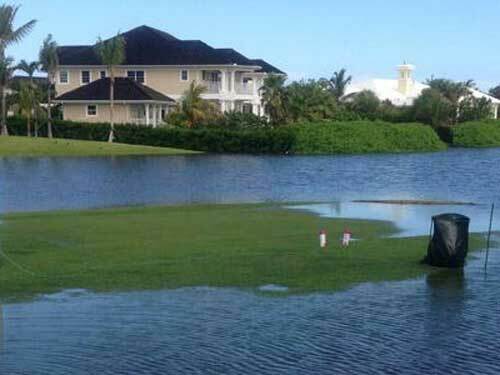 There was so much water on the course — the entire 18th fairway was covered — that the tournament was reduced to 54 holes. The first round is to start Friday with a Sunday finish, leaving some flexibility in case more showers cause problems. The rain wiped out the pro-am, so the LPGA Tour hastily arranged for players to meet at a restaurant at The Atlantis for a question-and-answer sessions with the amateurs. The group of players included the top three in the world ranking — Inbee Park, Lewis and Pettersen, along with Brittany Lincicome and Natalie Gulbis. It was an example of how the LPGA players try to do a little more, and it goes back to pop quiz for Lewis. “It caught me off guard,” Lewis said. “I said it was a different experience than the PGA Tour and your customers will love it. I think that’s more why they did. The LPGA stars all turned out for a pro-am party Tuesday night at The Atlantis, with its massive aquarium as the backdrop. As for the golf? No chance. The rain fell so hard and for so long that on Wednesday morning, the tip of a red hazard stake down the right side of the 18th fairway was barely visible. The entire hole was a water hazard except for the tee and the green. On the adjacent ninth hole, water covered a deep bunker on the left side of the green — two turtles were swimming in what had been a bunker — and it was nearly coming onto the green. Whan asked some officials from The Bahamas if they should have considered an earlier date. The advance staff had not seen much of a cloud of the last week. “They said they had never seen a storm like this, so we’re probably in a good spot,” Whan said. Lewis is trying to get back to top spot after winning the LPGA Founders Cup in Phoenix in March to reach No. 1 in the world. Not since Beth Daniel in 1994 had an American won LPGA player of the year, and Lewis was on an upward trend by winning the HSBC Champions in Singapore and the following week in Phoenix. Park won the Kraft Nabisco Championship and replaced Lewis at No. 1. There now is a three-way battle — and it could grow — as the LPGA Tour heads into the heart of its major championship season, including a return to St. Andrews. Lewis is concerned with the careless mistakes leading to bogeys, though the real struggle is finding a balance with her recent star power. She is one of the more remarkable stories in women’s golf, having spent most of her childhood in a back brace because of scoliosis, and then having to go through surgery after high school to install a rod and metal screws. None of that kept her from reaching the top. As for the attention? She is getting recognized more often. She gets some of the largest galleries, even when playing early in the morning. In her first tournament after going to No. 1, Lewis had interviews in the morning, went to practice, another session of interviews in the afternoon, followed by a video interview, a photo shoot and the pro-am party. After a morning practice Tuesday this week, she headed over to Atlantis for a promotional spot — she swam with dolphins. That was fun. And after getting out of the water, it started to rain. If nothing else, Wednesday brought a day of rest.